Police in Spain's Catalonia region have begun transferring medieval artefacts on Madrid's orders in an ownership battle with neighbouring Aragon. The operation, which started before dawn on Monday, involves 44 items stored in the Catalan Museum of Lleida but originally from Sijena monastery. Aragon claims they were sold illegally by the monastery's nuns. The seizure comes as tension continues between Madrid and Catalonia over the region's independence push. 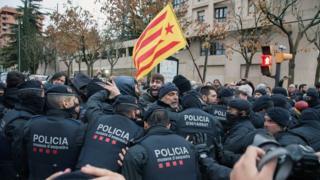 There were minor clashes between the police and protesters who had gathered outside the Lleida museum against the operation, which started at 04:00 (03:00 GMT). The legal dispute over the items dates back to the 1980s, when the artworks were purchased by the Catalan government. But a court declared the sale null and void in 2015. The transfer was ordered by Spain's Culture Minister, Íñigo Méndez de Vigo, who used special temporary powers to accept a petition by a judge in Aragon. Eight hours after the operation started, the first artefacts were removed from the museum amid strong security. The decision, taken while Madrid exerts direct control over Catalonia following the region's secession push, angered pro-independence groups, who called for demonstrations outside the museum. The sacked former Catalan leader, Carles Puigdemont, accused the Spanish authorities of plundering Catalonia.